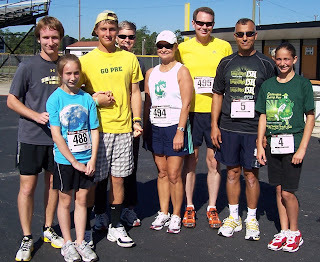 Several Okefenokee Track Club members and other local runners participated in Jesup’s Yellow Jacket 5K and 1 Mile Buzz Run on April 4th. Fast times were posted including Matthew Garmon’s winning 5K time of 17 minutes and 21 seconds. Also impressive was Sydney Alitarawneh’s 1 Mile time of 6 minutes and 53 seconds, earning her the fastest female award.